Become a Sustaining Supporter of the Humor Times on our Patreon Page! Become a Sustaining Supporter on Patreon.com, get rewarded! Politics can be depressing, especially when it seems our so-called “leaders” are completely out of touch with average people. But high-quality political satire can help our nation through this tough time! So, help the world by supporting political humor: please consider becoming a Sustaining Supporter via our Patreon page. 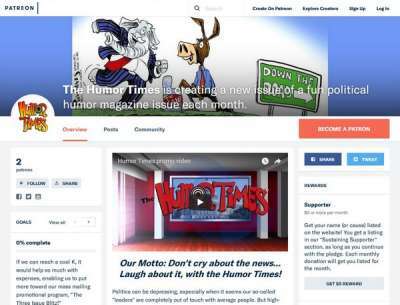 Help lift everyone’s spirits by supporting great political satire and the Humor Times! We’re happy you’re enjoying our website, but please consider becoming a Sustaining Supporter via our Patreon page of our Humor Times monthly magazine, which features the finest in editorial cartoons (many more than you can find on this site), arranged by subject and connected with a running narrative, designed to report the news the fun way! Mailed straight to subscribers each issue, it also includes hilarious political humor columns, satirical news stories, and much more. 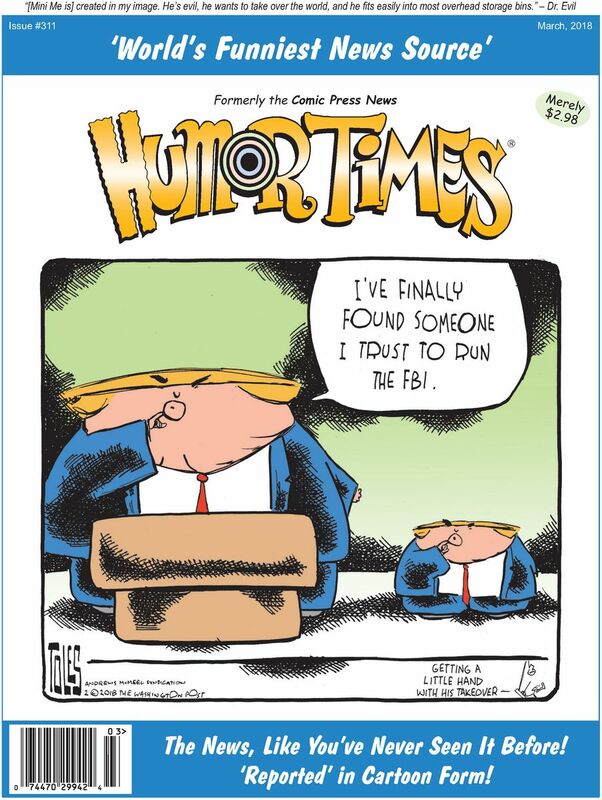 We Americans need to keep our spirits up, to fight the good fight, and that’s what the Humor Times is all about! Our subscriber rolls (the magazine is available in print and digital formats) are growing, slowly but surely, as people discover us. However, we need to do better to survive in this internet age. Now, as everyone knows, the recent decade or so has not been very kind to print. But, while the market for print in general has declined, there still is a market — and now, less competition! 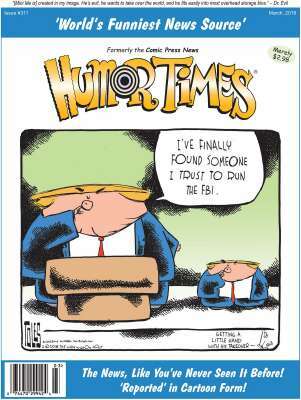 The Humor Times (launched in 1991 and originally titled the Comic Press News), is one of the survivors. With just a little support and energy from the larger community, we believe it could grow its share of the still-viable print market. Please help this unique and important publication prosper by becoming a Sustaining Supporter through our Patreon page! We can really use your support, and people can really use the political humor. What Word Will the Trump Mob Kill Next?